Detoxes have always intimidated me. Like many vegans, food is my passion and being deprived of its bounty doesn’t appeal to me. Plus, detoxes are often expensive and unexciting. If you agree, the Rawjuvenate Organic Detox will be a welcome surprise. The system is composed of five products: Organic Super Greens, Vegan Protein Powder, Super Aloe, Vegan Probiotic, and Super Fiber. You can purchase this raw, plant-based detox in either a 14 or 30-day kit, depending on your own personal needs. Admittedly, I was hesitant so I decided to try the cleanse for just three days. My first impression? It was quite tasty! My smoothie was creamy, thick, and packed with essential vitamins and minerals. I could definitely taste the protein powder but it wasn’t overpowering. I don’t usually add protein powders to my smoothies. Maybe that needs to change because this smoothie kept me feeling full until lunch. Before my solid meal, I took one Super Aloe capsule and one Probiotic capsule. To say the least, my digestive tract was happy. I didn’t take the additional Super Fiber laxative because my body didn’t need it. But, if you need a little extra elimination boost, go for it! 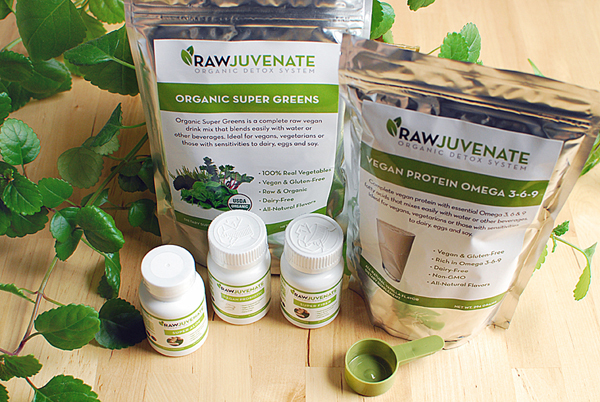 Overall, I was pleased with the Rawjuvenate Organic Detox System. It’s simple, effective, and allows you to enjoy solid meals while on the cleanse. I noticed consistent results over the course of my 3-day detox. I wasn’t left feeling hungry and my digestion was humming along nicely, just as it should. I recommend this cleanse to anybody striving for optimal health, a fresh start, or extra nutrition and supplements during the week. Have you tried the Rawjuvenate Organic Detox System? Were you skeptical at first? How did you feel after completing the detox? That can be the on-camera flash or another off-camera flash. other kids or many such activities brings lot of germs with them. Yes! Finally someone writes about raw chocolate. I have been taking the 2 week detox for 10 days. I feel no change. Fiber doesn’t help me, and I’m still hungry most the time. I have read great reviews, so maybe its just me. ← Recipe: Vegan Pizza Day is coming June 29!